Strider Knives makes extremely tough, hard use tactical knives geared for military war fighters. Everybody who works at Strider has a military background, so military folks are their priority. 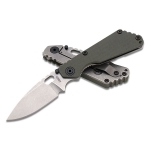 Strider makes large, medium and small fixed blades as well as folding knives and specialty tools. They also do their best to get gear ordered to soldiers before their deployment date. Strider swears by their plain edge knives and is known for the unique tiger stripe finish that adorns many of their knives. Strider also offers an excellent warranty. Below is a chart showing the best Strider knives on the site as reviewed by multiple users. Keep in mind that there are many great Strider knives out there, but if you can't decide on one after searching the site, choose one off this list and we are confident that you will be happy!